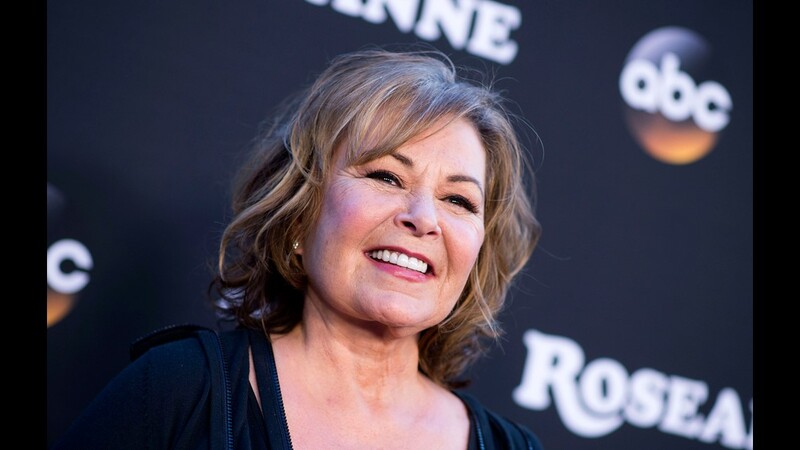 Roseanne Barr's racist tweet about Obama administration official Valerie Jarrett cost her an ABC show and the support of most of her fellow Trump supporters in the media. But not everyone turned their back on the beleaguered comedian after her self-inflicted public relations nightmare (although Barr blames sleeping pills). Several conservative figures stepped forward to defend Barr after she was fired, decrying a hypocritical Hollywood culture and censorship in the name of an overzealous political correctness. When the news broke that the Roseanne reboot had been canceled, Republican strategist Noelle Nikpour said on the Fox News show Outnumbered Overtime, "We live in a politically correct world right now." "It's not about political correctness, it's racism," responded Fox News' Jessica Tarlov. Nikpour said that Barr's tweet was "ugly" and "not nice" but she said, "let's just leave it at that" and resisted Tarlov's cry to label the tweet racist. "I don’t understand it to be anything other than free speech," said host Harris Faulkner. "It is extremely offensive but it is just that. And she says in one of her tweets — there were three rapid-fire today — 'It was a joke. It was a miscalculated joke.'" "She is a comedian," Nikpour agreed. "She does have a very wicked, twisted sense of humor. Everybody knows her to be a little raunchy and a little rough." 2012 Republican presidential candidate Herman Cain said ABC had "been looking for a reason to cancel Roseanne." "Even though the show was a ratings success, I believe that forces within ABC didn't like the fact that her conservative defense of certain things was so popular and getting such ratings," Cain told Fox Business Network Trish Regan. "The irony of Disney canning Roseanne while continuing to employ some of the industries biggest racist and race baiting frauds like Jemele Hill, Bomani Jones, Steve A Smith is not lost on most," tweeted former major league pitcher Curt Schilling. "Oh and at the same time hiring a scum of a human in Keith Olbermann." Rocker Ted Nugent, who has sparked outrage with his own controversial comments on multiple occasions, tweeted, "So Roseanne referencing a movie title is racist. Lying dishonest soulless freaks from Planet of the Apes." Former White House spokesman Anthony Scaramucci said, "When I was called a human pinkie ring and a goombah while in the @Whitehouse that was deemed acceptable comedy. Double standard. We better stop the macro punishments for micro aggressions soon. She made a joke in poor taste move on." "It’s time for you to strike back against these THOUGHT POLICE and really shake them up!" Right-wing conspiracy peddler and Sandy Hook denier Alex Jones told Barr. "You’ve been on the show before and it’s time for you to come back on!" Jack Posobiec, who is described by Wikipedia as "an American alt-right Internet troll and conspiracy theorist," pointed to what he sees as a double standard in the "mainstream media." "I'm a black man and I stand with @therealroseanne!" tweeted conservative commentator Oliver McGee. "Yes, she made a horrible joke and she apologized. I see comedians, actors, etc make the same jokes and get applauded for it. This is outrageous." "Keep your chip up my friend," McGee told Barr. He also called for a boycott of ABC. What I find fascinating is that WHITE social justice warriors are the ones freaking out the most about @therealroseanne’s comments. White SJW’s are quick to defend black Americans because they don’t think Blacks are capable of defending themselves. I think that’s pretty racist. There is a BLACK character in the movie #BlackPanther named ‘Man-Ape.’ Man-Ape is the leader of the Gorilla tribe. The gorilla tribe is played by all BLACKS. Every liberal that is calling for @therealroseanne’s head LOVED & RAVED about Black Panther. 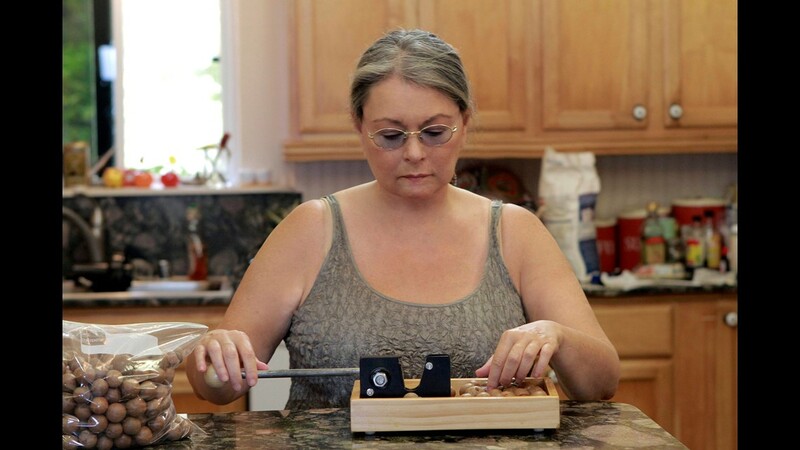 "Roseanne made some racist comments, apologized for it and her show was taken off the air. Joy Behar, Joy Reid and Jimmy Kimmel make racist comments, constantly attack this administration for their beliefs in god and yet they still have a platform with no recourse. LIBERAL BIAS!" said Students for Trump Chairman Ryan Fournier. "Can you imagine having your whole day (or week if you're a Liberal) ruined because someone insulted you," tweeted radio host Bill Mitchell. "Man, that has to be an awful existence. Living as a snowflake on a planet with a sun." I'm not sure how saying someone looks like a child of "Muslim Brotherhood and Planet of the Apes" is racist. I thought "Muslim Brotherhood" was supposed to be a "good" thing and Liberals say we are descended from apes? "Roseanne is an outcast now," said Pizzagate conspiracy theorist Mike Cernovich. "Send her love. She needs it." Joy Behar called Christins mentally ill. Roseanne was fired and Joy Behar wasn’t. Daily Wire contributor Michael Knowles said while Barr's tweet was in poor taste, "the popular furor to fire her is mostly performed and motivated by the Left’s hysterical contempt for anyone even vaguely supportive of President Trump." 2. The popular furor to fire her is mostly performed and motivated by the Left’s hysterical contempt for anyone even vaguely supportive of President Trump. Although President Trump didn't explicitly come to Barr's defense, he did imply ABC was guilty of hypocrisy. Bob Iger, the CEO of ABC's parent company Disney, called Jarrett to apologize for Barr's tweet, but Trump said Iger never called him to apologize for all the "HORRIBLE statements" made about him by the network. Fox News personality Tomi Lahren cautioned "fellow conservatives" not to play "mental gymnastics trying to justify" Barr's tweet. "Come on. Wrong is wrong," she said. 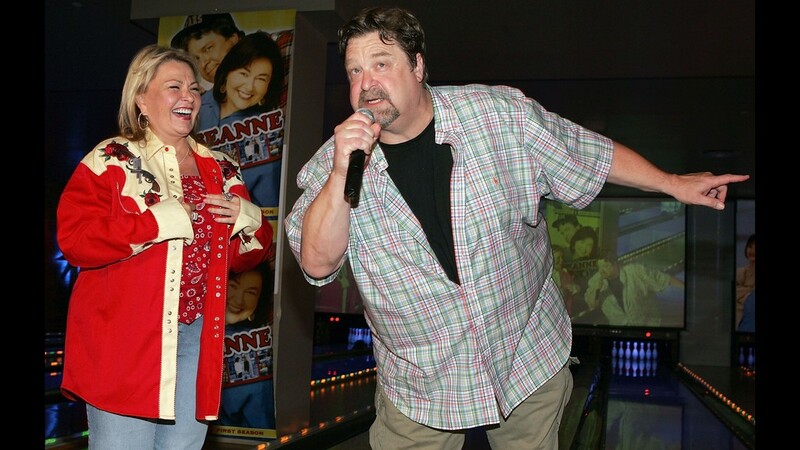 To all the Trump supporters outraged over the ABC/Roseanne double standard, I get it. Here’s the thing, we know we can’t get away with what the Left can. We have to be better. We have to rise to the occasion & act right. Our words are more powerful when we can stand behind them. "To all the Trump supporters outraged over the ABC/Roseanne double standard, I get it," Lahren tweeted. "Here’s the thing, we know we can’t get away with what the Left can. We have to be better." All the support on Twitter seems to have given Barr second thoughts about quietly accepting her show's cancelation. "You guys make me feel like fighting back," she tweeted. "I will examine all of my options carefully and get back to U." Roseanne Barr attends the series premiere of "Roseanne" in Burbank, Calif. on March 23, 2018. ABC canceled its hit reboot "Roseanne" on May 29, 2018 following lead Roseanne Barr's racist tweets about former Obama White House adviser Valerie Jarrett on Twitter. 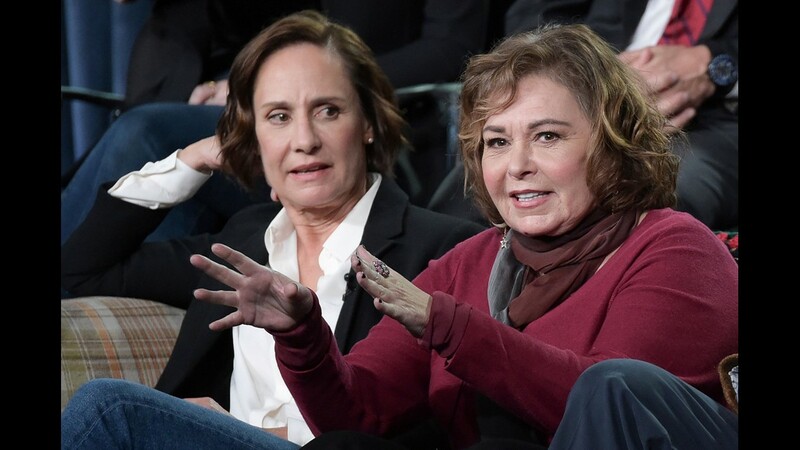 Laurie Metcalf, left, and Roseanne Barr participate in the "Roseanne" panel during the Disney/ABC Television Critics Association Winter Press Tour on Jan. 8, 2018, in Pasadena, Calif.
Roseanne Barr, left, and John Goodman in a scene from the "Roseanne." 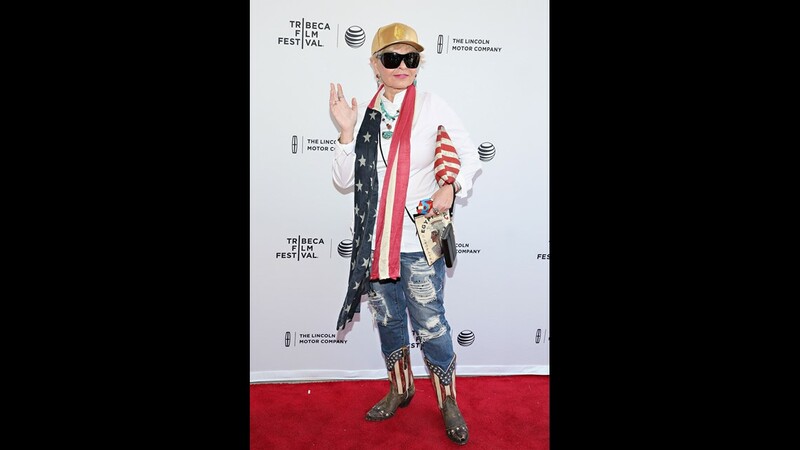 Roseanne Barr attends the world premiere of the documentary: 'Roseanne For President!' during the 2015 Tribeca Film Festival on April 18, 2015 in New York. 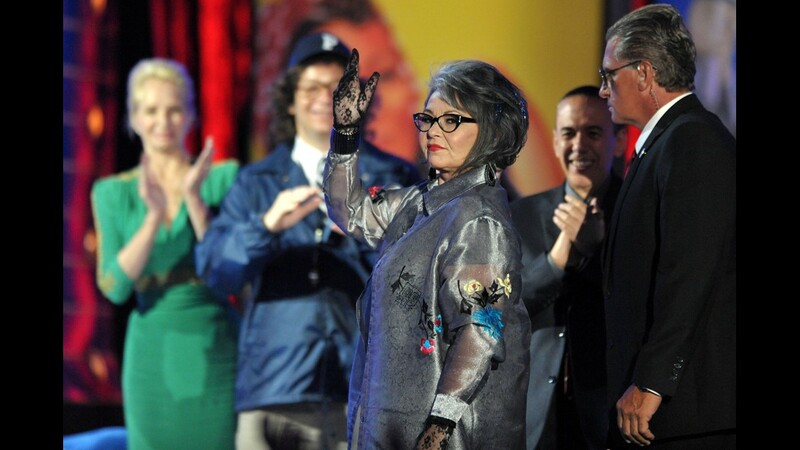 Roseanne Barr appears on stage at the Comedy Central "Roast of Roseanne" at the Hollywood Palladium on Aug. 4, 2012, in Los Angeles. Michael Fishman, Roseanne Barr, and Alicia Goranson arrive at the Comedy Central Roast of Roseanne Barr at Hollywood Palladium on August 4, 2012 in Hollywood, Calif.
Roseanne Barr in a scene from her reality series, "Roseanne's Nuts" about her macadamia nut farm in Hawaii. 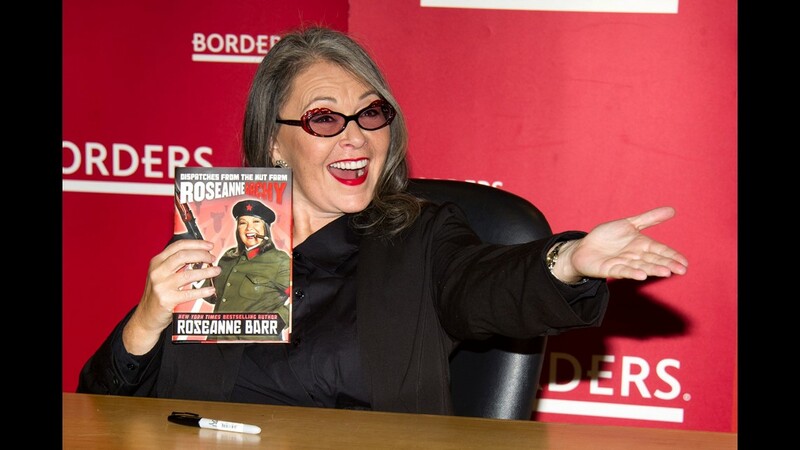 Roseanne Barr attends a signing for her book 'RoseanneArchy' in New York, Jan. 6, 2011. 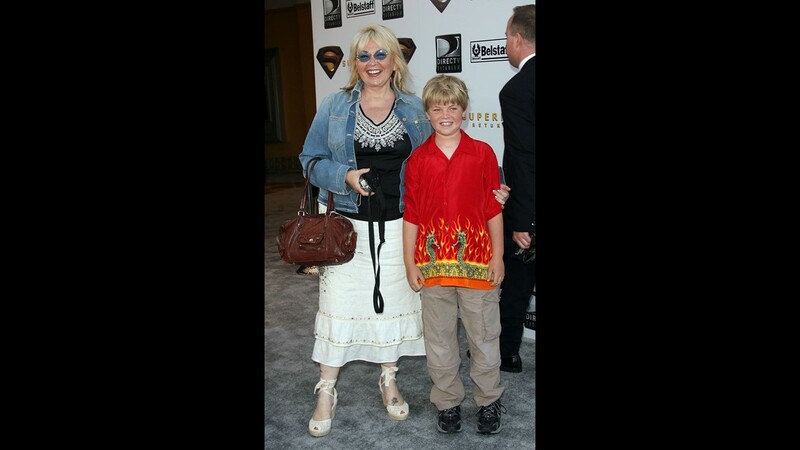 The cast of "Roseanne" accepts the Innovation Award onstage during the 6th annual "TV Land Awards" on June 8, 2008 in Santa Monica, Calif.
Roseanne Barr and her son arrive at the Warner Bros. premiere of "Superman Returns" on June 21, 2006 in Westwood, Calif.
Roseanne Barr and actor John Goodman attend the DVD launch of "Rosanne: Season One" July 18, 2005 at Lucky Strike Bowling Centre in Los Angeles, Calif.
Roseanne Barr at her home in Roling Hills estates in Long Beach, Calif on July 28, 2003. 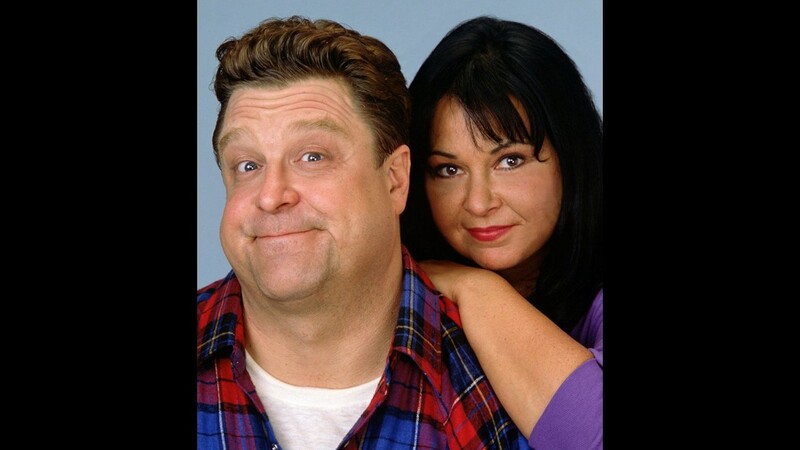 Roseanne completed a reality show, the Real Roseanne Show, for ABC the network that made her a star. Mistress of Ceremonies, Roseanne performs during the Lane Bryant Spring 2003 Intimate Apparel Fashion Show at the Manhattan Center Grand Ballroom on February 4, 2003 in New York. 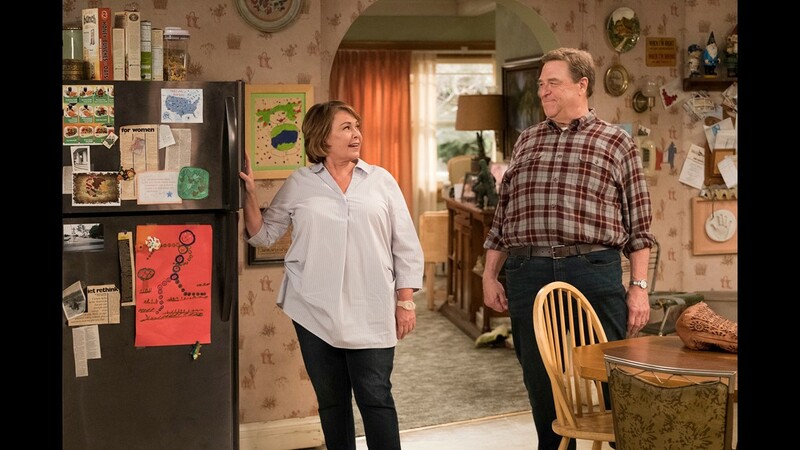 Roseanne Arnold and John Goodman star as the Conners in the popular comedy series, Roseanne on ABC. 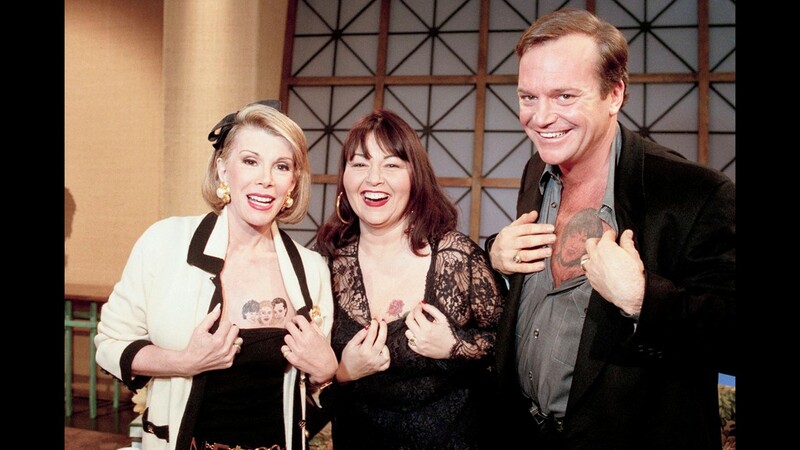 Tom and Roseanne Arnold match tattoos with host Joan Rivers during a taping of the "Joan Rivers Show" on Jan.18, 1993 in New York. Arnold wears a tattoo of his comedienne-wife, Roseanne wears a rose and Rivers sports a removable tattoo likeness of all three. 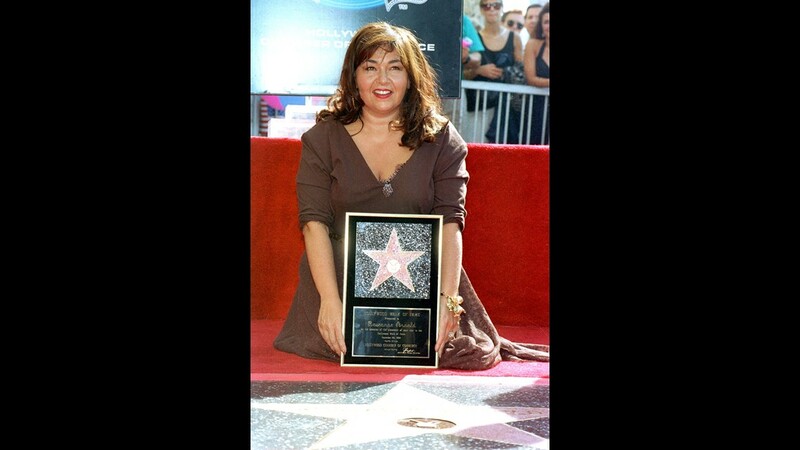 Roseanne Barr poses with her plaque award in front of her star on the Hollywood Walk of Fame in Los Angeles, Ca. on Sept. 25, 1992. 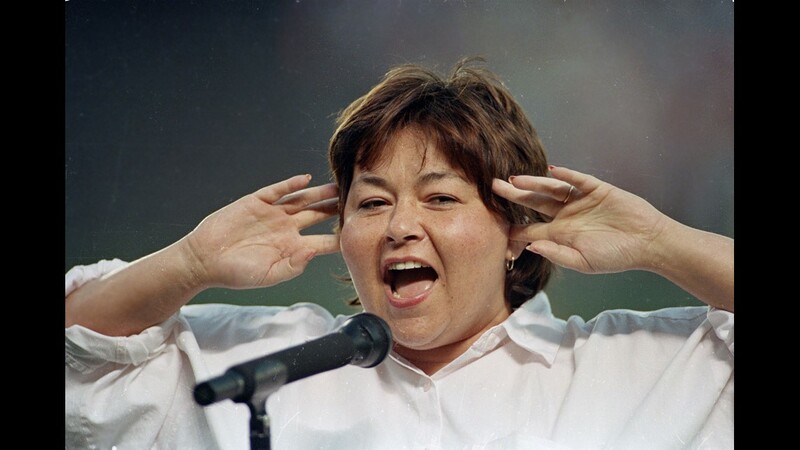 Roseanne Barr holds her fingers in her ears as she screams the National Anthem between games of the San Diego Padres and the Cincinnati Reds doubleheader on July 25, 1990 in San Diego, Calif. She was booed loudly and she made an obscene gesture and spat when she was finished. 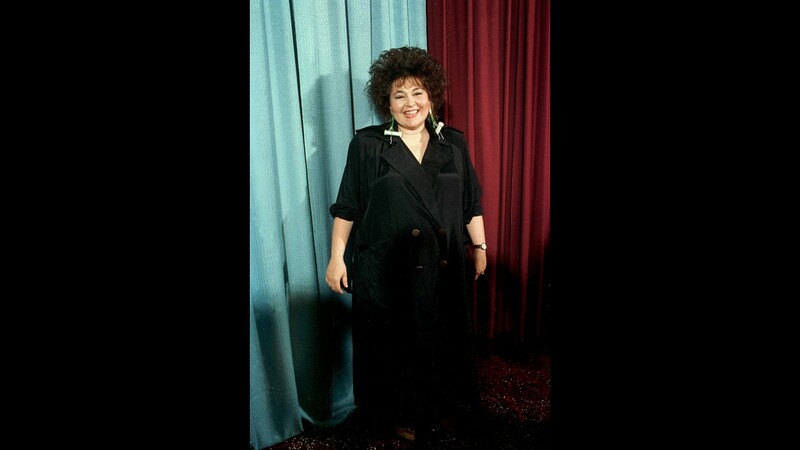 Roseanne Barr poses at the Ameican Comedy Awards in Los Angeles, Calif., on May 19, 1987.